The Orlando Water Hole podcast is a local favorite. You can always count on the podcast’s wonderful host, Ben, to keep you up to date on what’s going on here in the town where Mickey Mouse lives. I was super excited to be included along with Maureen from AutismAtTheParks.com and Kellie from SeaWorldMommy.com to come on to the show and talk about holiday highlights at all of your favorite Orlando theme parks. It was such an honor to be included in this esteemed panel! Ben was a terrific host, as always and he kept the show at right around 30 minutes. As a podcaster this is no easy task, especially with 4 guests on the show at once! I hope you’ll tune in and find the show helpful if you are a local or a tourist who wants to come spend some time in the parks this holiday season! You can catch the show by clicking HERE. Where you can find a giant hippo as a holiday icon! New enhancements to classic Disney attractions. The connection beagles have to polar bears. Where in Orlando you can find Baby Sinclair. Where you can hear the festive sounds of Mannheim Steamroller live! Favorite holiday events outside the theme parks! 5) Sharing some laughs along the way! Disneyways is PR Friendly and welcomes product reviews, giveaways, sponsorships and other promotions based on companies and products that would be beneficial or of interest to Disneyways readers. Krista is native to Orlando, Florida. She is a former cast member, has 20 years of experience in marketing, is open to travel opportunities and advertising. Requests for reviews, promotions, guest writing, or site statistics may be directed to disneyways@disneyways.com. Krista is most easily reached on Twitter and Facebook. Her LinkedIn profile lists past professional positions. Disneyways is extremely proud to be a part of the Mousekejournals.com family! Krista was recently featured and interviewed as one of the people “shaping Orlando’s community”on Episode 7 of the Orlando Waterhole Podcast. You can hear her each and every week as a co-host on the Disney Parks Podcast. Most recently, she was invited to be a regular contributor to ChipandCo.com. Krista is available to discuss or comment on Disney-related news, social media in general, and a variety of other topics. Looking to work with Krista on a project? She has nearly 20 years of marketing experience – and she LOVES this stuff. Interested in advertising or partnering with Disneyways? Inquire here. Do you have a product, service or business that may be of interest to the readers of Disneyways? Contact us for opportunities. Legal: All trademarks, product names, company names, and logos mentioned, displayed, cited or otherwise indicated on this site are the property of their respective owners. This site is not a part of the Walt Disney Company nor their affiliates and all views expressed are those of the respective author. This blog is an unofficial fan publication and is not in any way affiliated with Disney World, The Walt Disney Company, or any of its affiliates or subsidiaries. All opinions stated within do not necessarily reflect the opinions of anyone else, and certainly not the Walt Disney Company. For questions about this blog, please contact us at disneyways@disneyways.com. Just as a refresher, what is Dapper Day at Disney and where did it all begin? Organizer Justin Jorgensen is said to have been inspired by the original Imagineer Illustrations of Disney Park designs. These images often portray guests dressed as though they are going out for a very upscale event such as an opera or a maybe a high-end restaurant. Why shouldn’t going to Disney still be on par with such grand affairs? Well, that is what Dapper Day is all about. It is a chance to realize those designer’s dreams. On Dapper Day, you bring those illustrations to life when you become those well dressed guests the designers imagined (or hoped) would be filling the park. 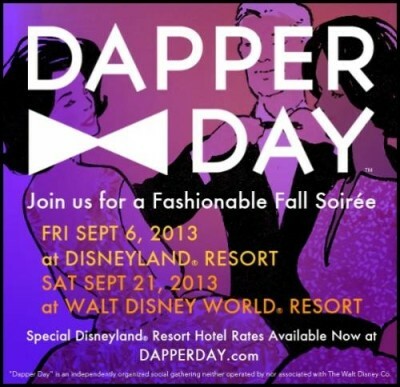 Started spring of 2011, Dapper Day organizes fashionable gatherings at The Disney Resorts in LA, Orlando, and Paris. February 24, 2013 was the date of the latest event. “DAPPER DAY Fall Soirée” Friday September 6, 2013 at Disneyland Resort, and Saturday September 21, 2013 at Walt Disney World Resort. Here is video of the February event at Walt Disney World! Dapper Day is NOT a Disney sponsored event. It is completely optional and perfectly OK to stay casual or not even participate at all. I would like to thank Tony from the Disney Parks Podcast for inviting my husband, Chris, and I as his guests at the D23 Member Mixer. It was a great event and so much fun! Here are the details of the event as posted on the D23 Member Website. TIME 5 – 7 p.m.
It’s Member Mixer time at Walt Disney World! Join the D23 Team for some great food and drink—and a terrific opportunity to socialize with other D23 Members and friends! Starting at 5 p.m., we will be kicking back in our own reserved area just for D23 Members and their guests. Upon checking in, everyone will receive one 15-percent-off coupon good on all merchandise in the House of Blues store, some goodies from House of Blues, as well as a little gift from your friends at D23. Guests will be able to order food and enjoy drink specials and delicious specialty cocktails. And don’t forget, D23 Members always save 15 percent off their food at House of Blues Orlando, known for their Shrimp & Grits, Pulled Pork Sliders, Jambalaya, and Hand Stretched Flatbreads. NOTE: Available only to D23 Members in good standing. This is a non-ticketed event. Members may bring up to three (3) guests. Space is limited. Limit one coupon/gift per person. For entry, members must present a valid photo ID AND D23 MEMBERSHIP CARD. D23 Members who do not bring their membership card may not be admitted to the event. All D23 Special Events are subject to change without notice. Ticketed Members who do not attend the event forfeit their place as well as all experiences, benefits, and gifts associated with the event. World Secrets ~ Character Signed…Sidewalks? This is one of the things I love about Walt Disney World. I have lived here in Orlando all of my life. I remember visiting the parks when I was so small – my Mom wrote our phone number on my hand in case I got lost. I consider myself to be fairly familiar with the Disney magic. Just when I think I can’t be surprised by anything Walt Disney World does, just when I think I have seen it all – something new (to me!) comes along that makes my eyes tear up. Once again I have to put my hand to my heart – because I still feel that little Disney Princess inside of me – and she is jumping for joy. When nobody was looking – each character must have taken the time to carefully leave a colorful chalk signature behind. Many guests were in a hurry and walked right over these treasures without even seeing them. Maybe I am missing something but I have NEVER seen this before. That’s why I am considering it a World Secret! I am left wondering who drew the Disney bus with the directional arrow? Do you have a guess? Please leave a comment below! Click here to read the Disney Diva’s Sidewalk Chalk Countdown to Walt Disney World. If you are an art fan, and a sidewalk chalk fan, you won’t want to miss Festival of the Masters. Here is information on the 2012 edition. This week at Disneyways – we had lots of fun, and we hope you did too! Our hope was not to repeat, but rather enhance all the other Disney news you saw around the web. We know you also want to stay in the loop, so keep reading to find links to all of the major events too. We hope you will enjoy having it all in one place. Please let us know how we are doing and subscribe to get Disneyways updates by email! December 1st we learned that perhaps Scuttle is interactive over at the new Little Mermaid ride…or maybe we just learned I need to lay off the Lefou’s Brew! Oh, and did you find the schedule of events for opening day at New Fantasyland helpful? December 2nd stirred up a facebook frenzy as we took a new look at an old video of the Splash Mountain gator. We shared video from a local Orlando news station about New Fantasyland too. December 3rd we revealed some Candlelight Processional Secrets – you may not have seen this any where else! December 5th we brought you a link some fantastic new Disney wallpaper for your computer! You may want to keep that handy because they are adding new ones all the time. We look forward to spending many more magical weeks with you! It was a historical week for the Disney World community! Our first view EVER of Disney’s new flying dragon. The celebration of Walt Disney’s birthday. Photo and Video Tour: Put on your coconut bra and grass skirt! It’s time for the Luau! I have wanted to go to Hawaii for pretty much as long as I can remember. I’m a BIG Elvis fan and the movie Blue Hawaii probably influenced this in some way. A tan, handsome, young Elvis gyrating among the beautiful scenery of a Polynesian background? What’s not to like?! I guess since I love the thought of Hawaii, I love the thought of a luau, even if it’s just right here in my home town of Orlando Florida. My mother first came up with the idea a few months before. She wanted to get the family all together for something really special and fun. I promise I did not suggest or influence her in any way to pick the Disney luau, she came up with it all on her own. It took about a month to get our entire group to agree on a date but it finally happened. We picked Friday April 27, 2012. This also happened to be my cousin’s birthday. Matt is a quiet guy who doesn’t like a lot of hoopla or attention on his birthday but he agreed this might be ok as long as we didn’t buy gifts or go to crazy. I sent out the first email and everyone seemed excited about the big day! I made a list of all the names and counted it 4 times. Could we really be a group of 16??? Yes we could – and in fact — we ended up adding one more a couple weeks later for a grand total of 17. Wow! We lost my Dad about a year ago and I just couldn’t stop thinking about how much he would have loved this. I missed him through the whole process (and again on the big night) but I feel like he was watching the whole time. I think he would’ve loved to make it a party of 18. My Mom decided on category 2 seating. When I called to make the reservation – all that was left was category 1. There was no changing the date now — so we went with it. I read and researched all I could about the luau just so I could make sure it was something everyone would like AND to try and help things to go as smoothly as I possibly could. The main thing that bugged me was why we had to be there an hour early. Disney policy states this for the luau and they even read you that policy again when you book the reservation. There was very little I could find on the internet about why this policy was in place. My Mom and I headed to the Polynesian a couple of days early to pick up what I thought were going to be “tickets” to the luau, which are normally at the concierge desk. It was that magic time of around 7:30pm however. 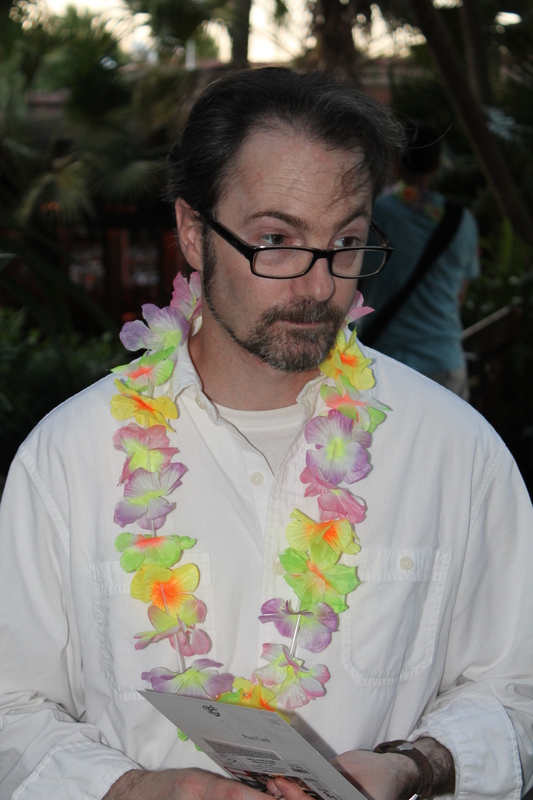 I knew there would be cast members at the luau podium this time of night so we made a beeline for the podium first with my list of questions in hand. I was shocked. This was a wonderful thing because I had no idea how I would see everyone beforehand to give them a ticket and what if they lost it? It’s just one little slip so I didn’t have to give anyone anything. Awesome. Next I asked him about being tardy. My nephew Jason would be working that night and not able to get to the luau until probably 9pm or later. The manager said that wasn’t a problem and if my nephew was REALLY late we could ask for a refund on his ticket. Finally, I asked him about seating. All he could promise me was that we’d be in Category 1 because that’s what was paid for. Oh well, I tried. Friday night finally came and we all met at my Mom’s to carpool. We got through all the gates and parking without incident. Everyone was in a great mood when we arrived. I was SO glad I had talked to the manager because even though we weren’t super early, we still ended up standing around outside with no where to sit for 20 minutes or so, even after the formal pictures were taken. When we finally got in however, things went great. The food was fantastic, the show and costumes were awesome. I couldn’t help but bob my head and wiggle a little in my chair to that music. It was a wonderful night. One of the highlights of the night was that they just happened to pick my nephew, pull him up on stage, and have his shake his booty like a rock-star. He was a great sport! Here’s a few photos from our big night. This is not video that I took but it’s a great 4 minute clip of what the show is like. All in all, we had a blast. Go see this thing if you get a chance! I hope you enjoy it as much as I did.